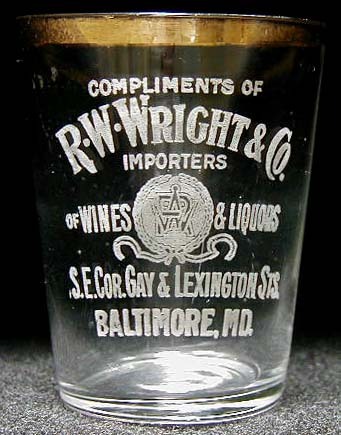 Inscription: COMPLIMENTS OF / R.W.WRIGHT & CO. (arched) / IMPORTERS/ OF WINES (design consisting of frosted wreath with RW monogram in tsp letters) & LIQUORS / S.E.COR.GAY & LEXINGTON STS. / BALTIMORE, MD. Dimensions: 2-1/2" x 2" x 1-1/2"
Condition: There are smudges of etching compound and an abrasion at left, and multiple superficial marks from handling over the years, but otherwise excellent! Strong label, strong gold rim!